COPPER as ANTHELMINTIC for the control of gastrointestinal roundworms in LIVESTOCK - cattle, sheep and goats, Cooper oxide wire particles, copper sulphate. Copper was already used as a feed supplement against mineral deficiencies in cattle and sheep before the first synthetic anthelmintics where introduced in the 1940's. Its anthelmintic properties against gastrointestinal worms were also known, but were not clearly understood. In the last years the potential use of copper as an anthelmintic has been further investigated, especially as an alternative to synthetic nematicides for sheep and goats in view of the increasing problems with worm resistance to anthelmintics. Recent studies with copper oxide wire particles (COWP) or cooper oxide needles delivered to sheep have shown that the particles released in the stomach are slowly dissolved during about 3 months. During this time the particles remain in the folds of the stomach lining where they release copper ions that are lethal for the worms. Some field studies on sheep gave up to 95% control of Haemonchus contortus and up to 70% control of Teladorsagia circumcincta, two species that are located in the stomach of ruminants. But results in different studies were not very consistent. Unfortunately no efficacy at all was achieved against intestinal worms such as Trichostrongylus spp. Copper oxide can be delivered in capsules or boluses (normally not more than 2 g). Since little is known about it's toxicity to livestock it should not be used more than once a year per animal. There are also reports on efficacy of copper sulphate against Haemonchus contortus and Trichostrongylus axei in sheep, two species located in the abomasum. It has been recommended to use it as a 1% solution in water at a dose of 50 ml per lamb or 100 ml for adult sheep, and 30 to 100 ml for calves, depending on weight. It can be delivered with a flexible tube and a funnel, early in the morning before feeding, and followed by castor oil 30 minutes later. Animals should be not allowed feeding for two hours after treatment. 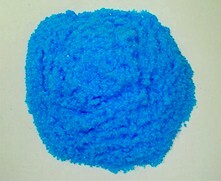 Warning: copper sulphate is toxic if slightly overdosed, particularly in sheep.